In a major initiative to pave way for energy-efficient buildings, the government has decided to make solar passive features mandatory for all structures in the areas where the Town and Country Planning Act is in force. Long-awaited rains today lashed some parts of the Kangra valley and gave respite from the scorching heat and the long dry spell. Indian Muslims were getting the best-ever living conditions and opportunities under a democratic Constitution in India than Muslims in any other country of the world. Narcotic gangs operating in Mandi district have now started operating in Chota Bhangal, the remotest area of Kangra district. Solang valley and back to Manali, here today. The Ani police seized around 103 boxes of country-made liquor and beer, which was being smuggled into Kullu district from Haryana through the Shimla-Rampu-Ani route. Despite the fact that the state government had allowed culling of monkeys in the state, the forest department is yet to start its campaign. With cultivation of crops taking precedence over needs of common man, thousands of people residing in the vicinity of Kasauli are forced to go without water for days. The BJP today accused the UPA regime of “discriminating against the state” in the matter of development. With thrust on organisational matters, including enrolment of new members, the BJP yesterday held meeting of its state office-bearers and the executive. Chief Minister PK Dhumal has urged the Centre to help in the revival of Nahan foundry in the interest of the people of the state. With a view to encouraging spirit of sports among the youths of rural areas, the government has launched a scheme called ‘panchayat youth sports campaign’. Yoga is the way of life to attain the ultimate truth and meditation is the means to achieve it further. While certain minimum features will have to be incorporated in the design of common residential structures, institutional buildings like schools, hostels, hospitals, government offices and commercial establishments like hotels will be required to have double glazing, solar water heaters and other features. In case of residential buildings, cross- ventilation, adequate windows to allow natural light and sun rays and some other provisions as per the energy conservation building code will be essential. A minimum percentage of the floor area of a room will have to be kept for windows for adequate natural light and the outer walls will have a minimum thickness of 24 cm. The energy-efficient buildings will have more opening on the south front and minimum on the north to help trap solar energy which will help maintain temperature during winter. The opening for cross-ventilation will be mostly on the east and west. These features have been incorporated in the building bylaws so that they could be enforced by various concerned agencies. The solar passive features will increase the cost of construction slightly. The cost of residential buildings could go up by about 5 per cent and in case of institutional and commercial complexes, by 10 per cent. It is negligible keeping in view the fact that the energy saving will be 50 to 60 per cent. The features will help save a lot of electircty in government buildings where lights are kept on throughout the day. This is the second major initiative to save energy. Earlier the government had implemented the Atal Bihari Bijali Bachat Yojna under which each domestic consumer was given four compact fluorescent lamps free of cost. The scheme was likely to bring down the consumption of electricity by about 30 per cent. The hill state is no longer surplus in power and this year power cuts are being imposed even during summer. Union Minister for Steel Virbhadra Singh has expressed concern over the manner and scale at which permission is being granted under Section 118 of the State Land Reform and Tenancy Act to enable outsiders to acquire land in the state. The liberal manner in which permissions were being granted, it seemed, that the entire Himachal was on sale, the minister who was in the city in connection with the conference of the Indian National Trade Union Congress, said. Land was scarce in the hill state and of late scarcity of drinking water was also becoming a problem. Land was difficult to find even for government projects in such a scenario, permission under Section 118 should be given for very weighty reasons, he opined. He advised Chief Minister PK Dhumal to be cautious on this front as it would have long-term implications for the fragile hill environment. He also expressed concern over the power shortage in the state which would hamper industrial growth of the region. The day was as usual very hot, but in the afternoon the sky was overcast with dark clouds raising hopes of the people to get some respite from the heat. At 3.30 pm, it rained heavily for about one-and-a-half-hour in Dharamsala, McLeodganj and neighbouring areas. Kangra town and other parts of the valley witnessed drizzle with fast velocity winds, but cold winds from Dharamsala gave people some respite from the heat. Kangra witnessed power disruption following storm, but it was restored later. 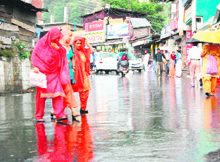 The reports of drizzle were also received from Palampur, Maranda and Mallan, but it rained at Chamunda. Kangra District Police Chief Atul Fulzele said the rains in the town were never welcomed but today it was a different story and the rains were welcomed by one and all as it gave relief from the scorching heat. This was stated by Maulana Mahmood A. Madni, MP from Uttar Pradesh and member of National Council of All-India Jameete-Ulemae-Hind, while addressing mediapersons here today at the Electricity Board Rest House. The Maulana, who was here to pay homage to popular Muslim scholar and leader Maulana Zahir Alam Badr Kazmi, said Kashmir was an integral part of India and Pakistan should not interfere in the matter. The police in the past three days has destroyed poppy cultivation in three hectare of area in various villages of the Chota Bhangal area. Kangra SP Atul Fulzele said the poppy cultivation was carried out on the reserve forest land. We received satellite photographs from the anti-narcotic wings regarding the possible poppy cultivation in the Chota Bhangal area. After that, a team of 10 police officials under Baijnath SHO Mast Ram was sent to the area. It spent three days and destroyed poppy cultivation in about three-hectare area. The locals also cooperated with the police in the operation. Sources revealed that a contractor from the Mandi area had engaged persons to cultivate poppy. Had the police been a little late in its operation the perpetrators might have walked away with the poppy produce, the SP said. He further said the police is looking for the contractor who allegedly got the poppy cultivated. However, no arrests have been made or case been registered as yet. Police sources also indicated towards involvement of organised syndicate in cultivation of poppy in the high altitude area. Cannabis is found naturally in Chota Bhangal area. However, poppy seems to have been sown deliberately to take produce of opium from it by organised syndicates. The detection of activity of organised narcotic syndicate in Kangra district for the first time has put the police authorities on high alert. Most of the villages in the Chota Bhangal area are still not connected with even rural roads. The people have to trek through mountains to reach their houses. The possibility of construction of roads further diminished after the area was declared as a part of the Dhauladhar Wildlife Sanctuary. Residents of the area boycotted the recent Lok Sabha elections to protest against inclusion of their area in the wildlife. Since most of the area is high altitude and difficult to assess the narcotic dealers who are hard pressed by the police in Mandi and Kullu districts might have decided to shift their operations in the Chota Bhangal area. Villages where poppy crop has been destroyed include Polling, Trimallah, Anderimallah, Yudhar, Kamer, Lowai, Nohata and Rukaru. Keeping in view carbon-free tourism in the state and to save Manali; Adventurehills, Johnson Lodge and Goldrop Venture organised a cycle ride from Manali to Solang valley and back to Manali, here today. Manali SDM Rajeshwer Goel flagged off the rally. Forty boys and girls participated in the rally, which was organised for creating awareness among people for promoting carbon-free tourism in the state. Goel said this year there was 28 per cent increase in the traffic flow to Manali as compared to last year. While addressing the rally, he said we should promote eco-friendly tourism in Manali to save the environment. Adventurehills was started in 2000 with a motive to boost pollution free environment for tourism in the state. Lately, in February, Adventurehills and Ti Cycles, India, have collaborated under the brand name BSA Getaways for promoting cycle tourism in the state. 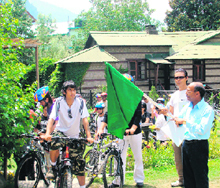 It is the first company to take steps towards carbon-free tourism in the state by promoting cycle tourism. This would help us in saving forest and environment from adverse effects of vehicular pollution. Police sources said the booty was being transported in a Mahindra pick-up vehicle (HR-63-2675) on Saturday night, when a police patrolling party stopped and checked the vehicle. Three persons, including the driver, fled away while the vehicle and the contraband was seized. A case under the Excise Act has been registered, the police added. It may be recalled that liquor was been smuggled to Kullu from Chandigarh and Haryana because the price difference was quite big. In the tourist season, smuggling of narcotics and liquor always remained on high in the valley. Farmers need research on new varieties that will prepare farmers for global competition, not research that generates “stacks of useless complicated research papers producing careerists that today crowd most institutions”, says Dr Charanjit Singh Parmar, who deserted job of an assistant professor at Horticultural University, Nauni, in 1992. Today, even at 70, he is busy compiling an encyclopedia of 4,000 edible fruits in the world. “I have added information of 285 fruits. But, age is advancing and need assistant of some institute to adopt this project,” he adds. He says most research in the state-run two universities is “career-oriented, not farmer-oriented” as it is the case in many advanced countries like the USA, Sweden, Canada and even Indonesia, which produces 67 tonnes of apple in a hectare area, the highest in the world. At best, our universities have produced careerists, providing employment to “middle brow researchers who toe their line”, he observes. He said all research should focus on trial on new varieties, new samplings and breeding of new varieties for the use of farmers. The gestation period is large and may take 15 to 20 years, but researchers must concentrate on new varieties, he asserted. He observes that farmers also remain obstinate, not willing to take on new challenges of trying and breeding new fruit varieties, as they expect that the government should do something for them. Dr Parmar, who is also a consultant for central Asia, cites examples- in the West: scientists and farmers associations have regular interaction trying out 10 new varieties, raising new plantations every year. “They share experience and then bring out the trials and tests in journals,” he adds. He says “dragon fruit” he has cultivated here is selling Rs 200 kg and so is case with apple cactus, an Israeli variety. Farmers and fruit growers in the district are worried that if no early action is taken, maize and other fruit crop would also be destroyed by the monkeys. Official sources said specific instructions to this effect had already been issued to forest department and forest officials should gear up its campaign so that standing crops could be saved. There are more than one lakh monkeys in Kangra district and out of it, over 80 per cent live in towns like Palampur, Dharmsala, Kangra, Baijnath, Paprola and Nurpur. The gravity of the situation could be judged that all panchayats in the district have been badly affected by the problem. The villagers, however, are increasingly feeling that this problem has become more acute because of the fact that monkeys have been provided “over protection” under the law like the Prevention of Cruelty to Animals and the Wildlife Protection Act. Besides, number of social organisations come to their rescue without realising the fact that monkeys had made the life of common man hell in the state. Organisations such as Save Palampur and Palampur Welfare and Environment Protection Forum, have urged the government to lift the ban on export of monkeys. These social organisations have asked the government to launch a massive campaign in the state to curb the growth of monkeys. Meanwhile, in the past one year, over 1,000 persons were bitten or clawed by aggressive monkeys in Palampur and its adjoining areas. Monkeys are also accused of snatching handbags from passers-by, stealing food from houses, medicines from hospitals and even files from government offices. It may be recalled that women and school- going children have become soft targets of mischievous monkeys in many parts of the town. They have also caused automobile crashes resulting in fatal accidents. Situation in villages, including Garkhal, Sanawar, Tickethatti, Ghosan, Chabal, etc., comprising a population of several thousands, has gone from bad to worse as far as water supply is concerned. Though the IPH department claims to have pressed tankers into service, but neither they are supplying water on a daily basis nor is the quantity sufficient. The area is virtually without any potable water scheme, at least for the summers, as the lone potable water scheme which is supposed to supply water to the area is conveniently used by the villagers to irrigate their fields where cash crops have been sown. The villagers have been repeating this act year after year. The department cuts a sorry figure while allowing treated water to be used for irrigating the crops while supplying unhygienic water through tankers to the people, that too in bits and pieces. Though the Rs 57-crore Giri water scheme was supposed to supply water, but despite more than a year of its installation, the pipes are yet to connect this area. Interestingly, this scheme provided nearly one crore litres of water to Solan everyday as against its requirement of 70,000 litres. The uninterrupted work at various construction sites and supply to commercial establishments, including hotels, led to the consumption of the additional 30,000 litres every day while people in the vicinity of Kasauli craved for even a decent amount of water. Though officials, when asked to work out some solution for this diversion, did manage to lift some water today, but the people were left high and dry when it was diverted elsewhere. Executive engineer Hemant Tanwar said such problems were occurring in several places as villagers refused to lift water owing to drying up of their fields. He assured that tankers would be made regular and possibility of boring more hand pumps would be explored. The state executive of the party, under the chairmanship of state party chief Jai Ram, here today passed a resolution, alleging that the interests of the state had been ignored whenever a Congress-led government came to power at the Centre. In the same resolution, it expressed concern over the drought-like conditions in the state and demanded special economic package to combat natural calamities. It mentioned that heavy rain last year caused damage to crops and property to the tune of Rs 2,000 crore but the state did not receive any assistance from the Centre. It also called for restoration of the rice quota of the state which had been reduced from 18 lakh tonnes to 7 lakh tonnes. It sought restoration of the industrial package upto March 2013 which was curtailed to March 2010. The resolution hailed the party’s performance in the Lok Sabha poll and expressed satisfaction over the fact that the vote share of the party increased from 43.97 per cent in 2004 to 49.37 per cent in 2009. Senior party leaders, including Chief Minister PK Dhumal, state BJP president Jai Ram Thakur and in charge of party affairs in Himachal Pradesh Satya Pal Jain, attended the meeting. The meeting of all state office-bearers and district chiefs was held. At present the BJP has about five lakh party members in the state. “As part of our nationwide campaign, enrolment for party membership will be started from July 6,” informed Jain. He said every party worker right from mandal level to the Chief Minister would have to seek fresh membership as it was in 1999 that the 10-year membership was done. State party chief Jai Ram Thakur said all organisational matters would be discussed and the enrolment drive would be launched to strengthen the party in every part of the state. In a letter written to the union minister for steel, Virbhadra Singh, the chief minister said with its limited resources it was not possible for the state to maintain and strengthen the workshop being run at the Nahan foundry. “This foundry has its own identity and place in the field of iron products so its revival would be of great importance to the state,” he says. He added that before its closure lot of iron products were being produced at the foundry. The foundry was established in 1875 by the maharaja of Sirmaur estate. It took the shape of a joint enterprise of the Government of India and the then maharaja but later his shares were bought in 1952 and it became a public limited company. As the foundry was incurring heavy losses it was converted into a workshop of the PWD and the IPH in January, 1998. Under the scheme, playgrounds and sports centres would be developed in a phased manner. According to official information, 28 panchayats had been identified in Chamba district in the initial stage. Ten per cent panchayats would be covered under the scheme per year, information revealed. However, Rs 1 lakh would be spent on the construction of each playground while Rs 10,000 would be spent on sports centres, the information revealed. This was stated by BH Patil, former senior scientist of the Vikram Sarabhai Space Centre, Trivandrum, and the person behind the launch of Chandrayyaan 1. He was addressing a gathering on the concluding day of the week-long All-India Yoga Training Camp held on the premises of the Jain temple at old Kangra today. The camp was organised by Vivekananda Kendra Kanya Kumari. More than 70 participants from Rajasthan, Gujarat, Tamil Nadu, Delhi, Jammu and Kashmir, Himachal Pradesh, Kerala, MP and Maharashtra attended the camp which was held for people between the age of 18 and 55 years.